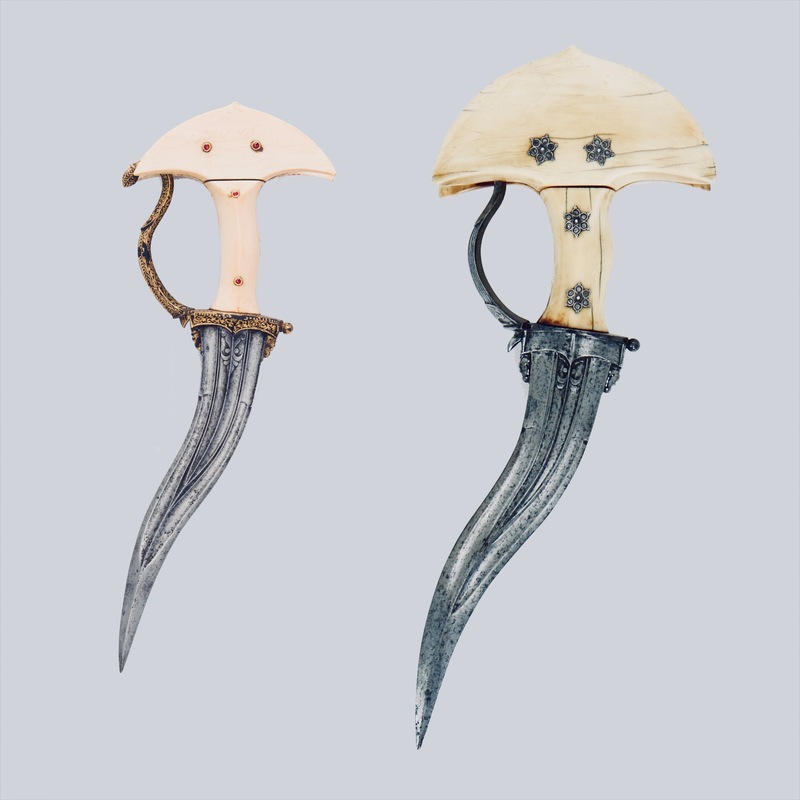 The daggers we now know as khanjarli are characterized by their recurved blade and large lunette pommels that are usually made of ivory plates. They seem to be a further development of the earlier chilanum , some of which have smaller pommels of similar shape. Khanjarli were probably primarily worn as status symbols for the wealthy, as they all tend to be of pretty good to superb workmanship. Most seem to date from the 17th and 18th centuries. Lacking a better alternative will stick to the name khanjarli for now. 1. Lord Egerton of Tatton; Indian and Oriental Arms and Armour. Dover Publications; Revised edition, 2002. Plate X and numbers 500, 501 and 504. 2. Stone, George C.; A Glossary of the Construction, Decoration and Use of Arms and Armor: in All Countries and in All Times. (Reprint) Dover Publications, 1999. 3. Elgood, Robert; Hindu arms and Ritual , Eburon Academic Publishers, Delft, 2004. Pages 179 and 202. 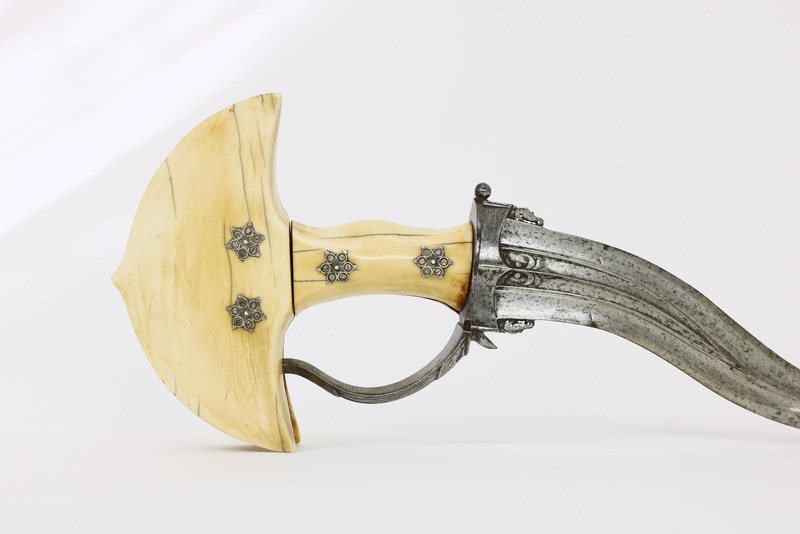 The massive hilt is made out of four plates of ivory ( Elephas maximus indicus ), two of which form the characteristic lunette pommel plates, each 17mm thick and 14.3cm wide. 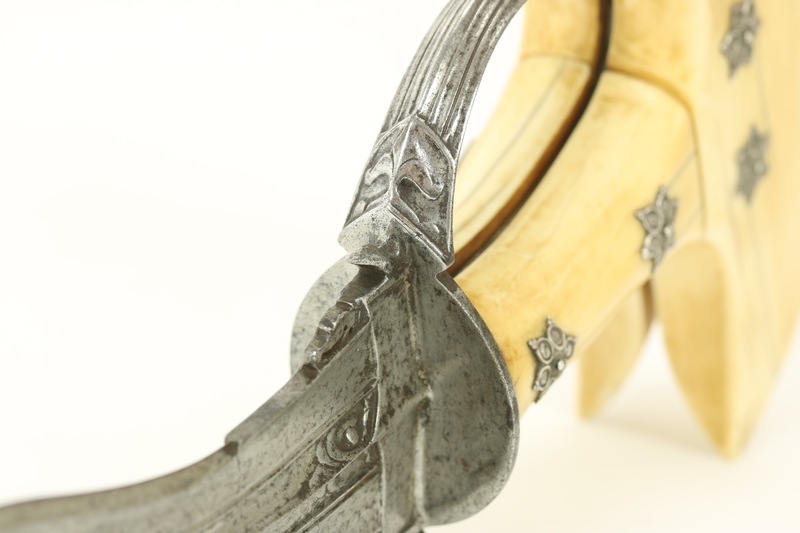 This makes it possibly the largest of such features I've seen on this type of dagger so far. 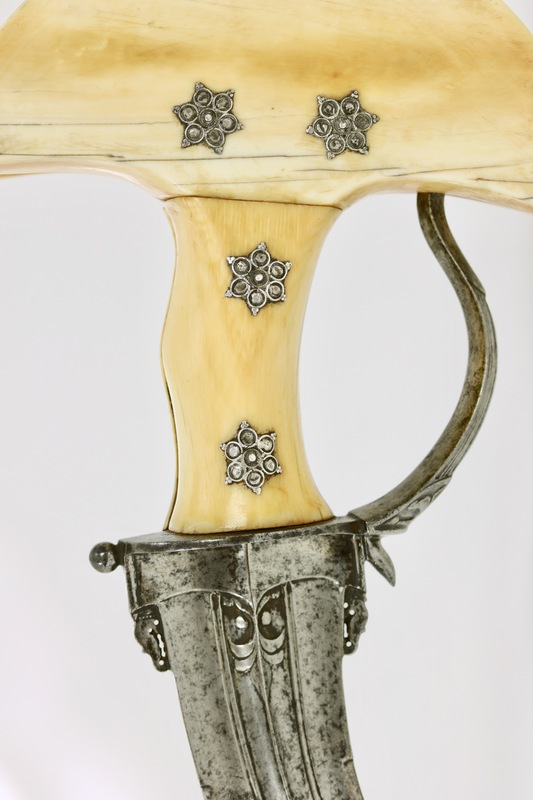 The pommel and handle plates are riveted to a flat steel tang and held in place by ornamental silver washers in the shape of six pointed stars. The ex George Stone example (left) compared to our large sized example (right). A magnificent example is in the Furusiyya Art Foundation Collection. 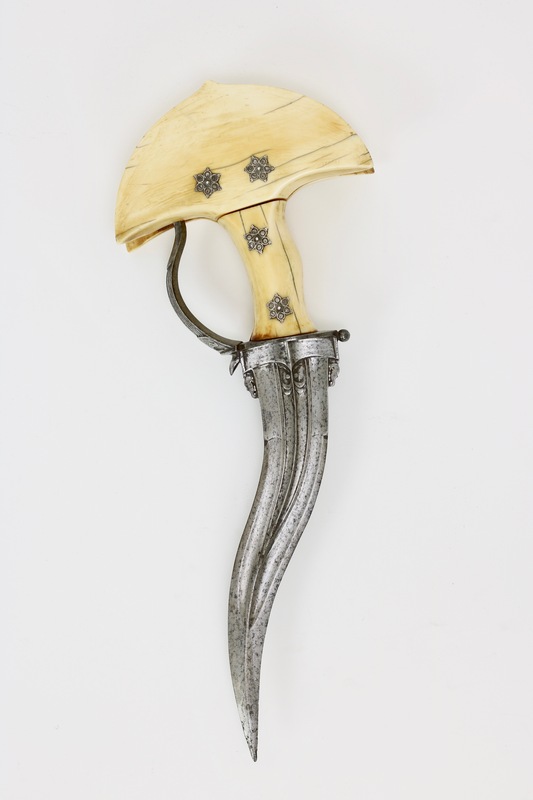 Its entire hilt is made of metal, entirely gilt and beset with green glass beads. This is probably a Hindu court piece of the 18th century. It was published in The Art of the Muslim Knights: The Furusiyya Art Foundation Collection , Skira, 2008. Page 223. 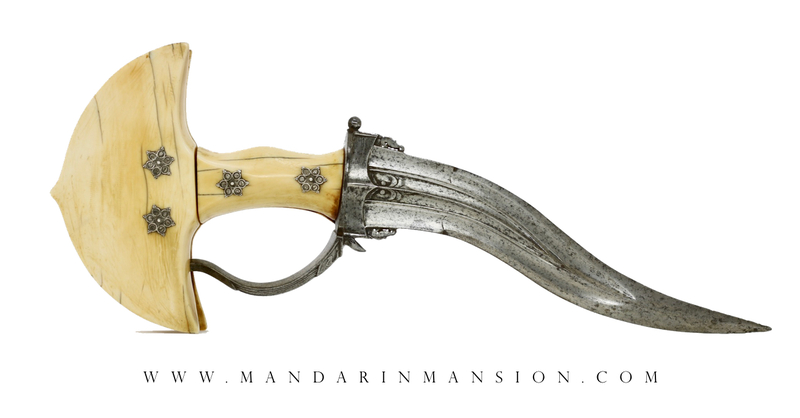 The earliest khanjarli in Western collections is a piece that entered the Royal Danish Kunstkammer in 1743. It is published in Dam-Mikkelsen & Torben LundbÆk. (editors); Etnografiske genstande i Det kongelige danske Kunstkammer 1650-1800 , (Ethnographic objects in the Royal Danish Kunstkammer 1650-1800), KØbenhavn, Nationalmuseet, 1980. Pages 106-107. Object number EAb11. 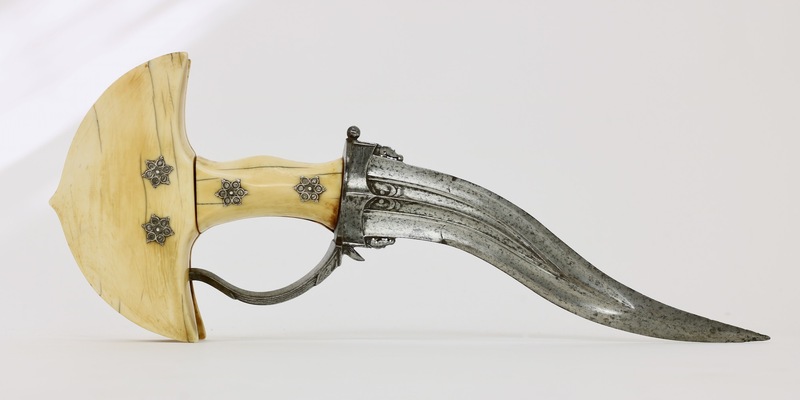 The khanjarli in the Royal Danish Kunstkammer that entered the collection in 1743. 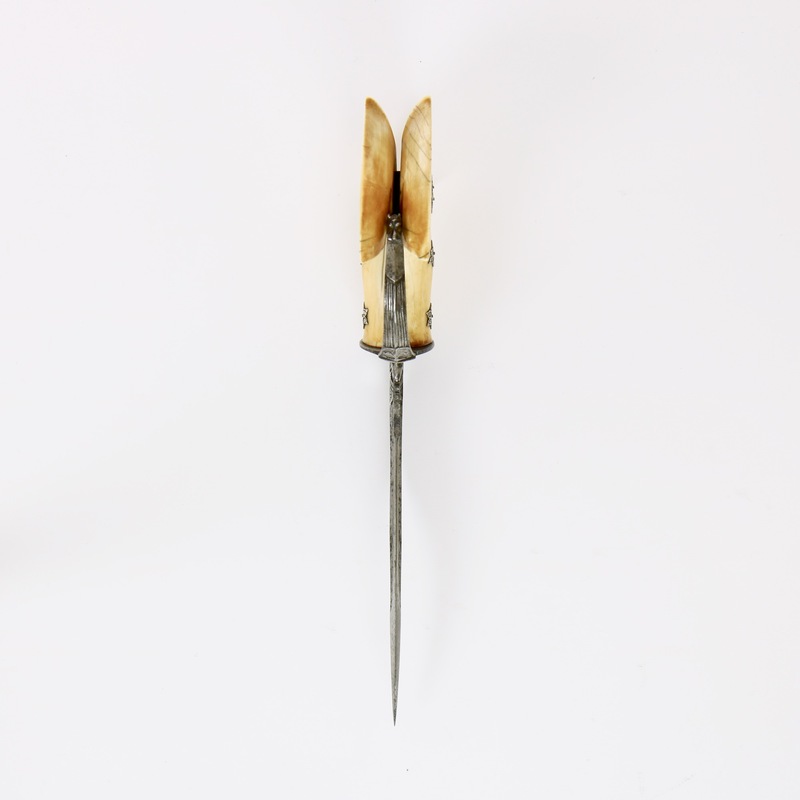 Tis example has a smaller lunette pommel, closer to the size of earlier chilanum daggers that indicate that the form had yet to reach full maturity. We don't know how old the piece was when it was collected, but if it were relatively new, that pushes the development of the more exaggerated models to probably around the mid 18th century. 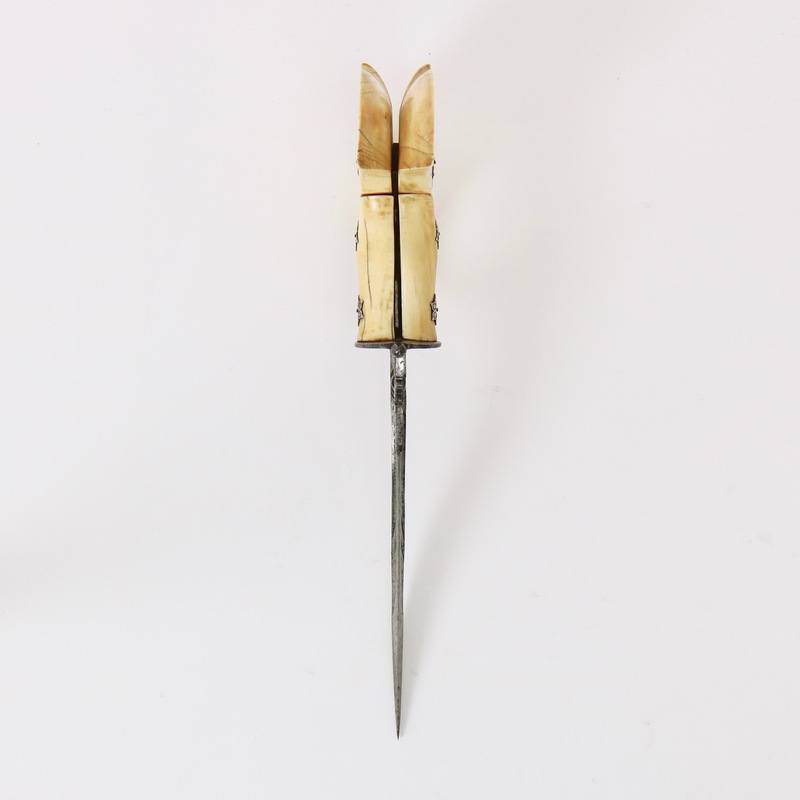 A fairly similar but poor condition example can be found in the Royal Collection accession number RCIN 69756. Two other examples in the same collection, accession numbers RCIN 38194 and RCIN 38194RCIN 38196 were presented to King Edward VII, when Prince of Wales, during his tour of India in 1875-76. Both were said to be from Vizianagram. 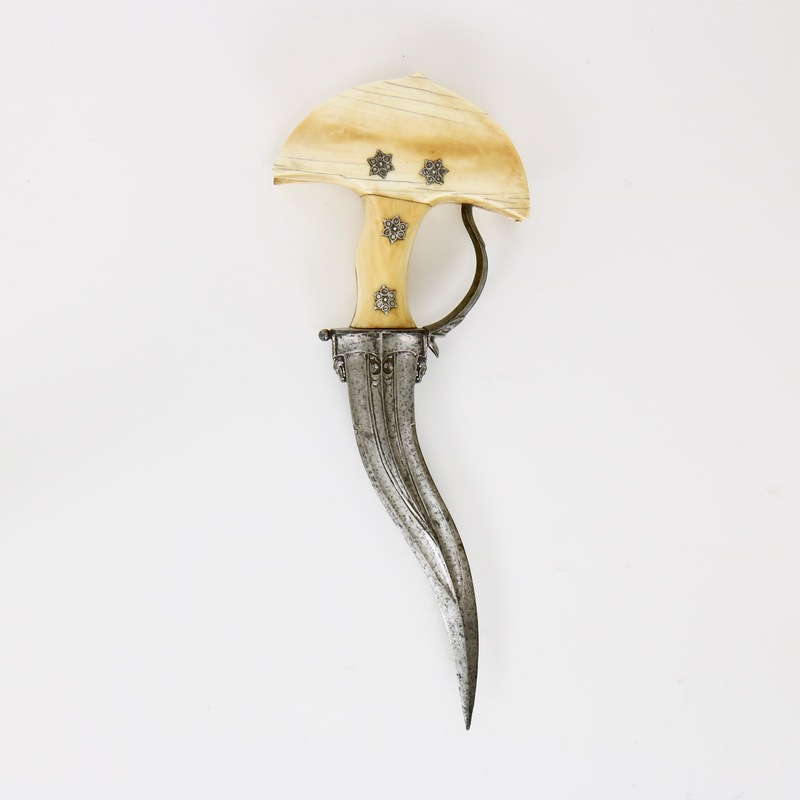 A predecessor of this style, in the form of a chilanum with ivory lunette pommel, was also presented to King Edward VII, when Prince of Wales, during this same tour. It was presented by Tukoji Rao Holkar II, Maharaja of Indore. Accession number RCIN 38194RCIN 37603. Indore is in the Indian state of Madhya Pradesh, to the West of Orissa and Vizianagram. What these locations have in common is that they were all Maratha territory in the 18th century. 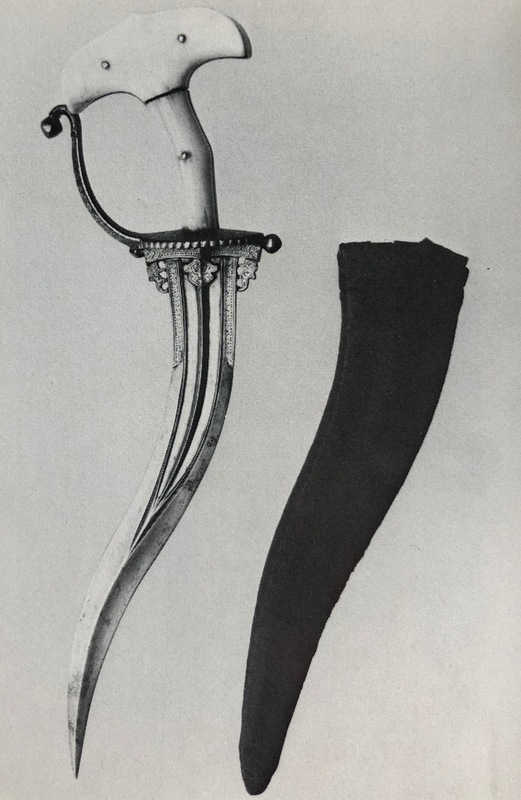 And finally, an very nice and example was published by Robert Hales in Islamic and Oriental Arms and Armour: A Lifetime's Passion , Robert Hales C. I. Ltd., Guernsey, UK, 2013. Page 2. This piece came with a little portrait with a note on the back. The note stated: " Portrait of the Maharajah of Vizianagram. 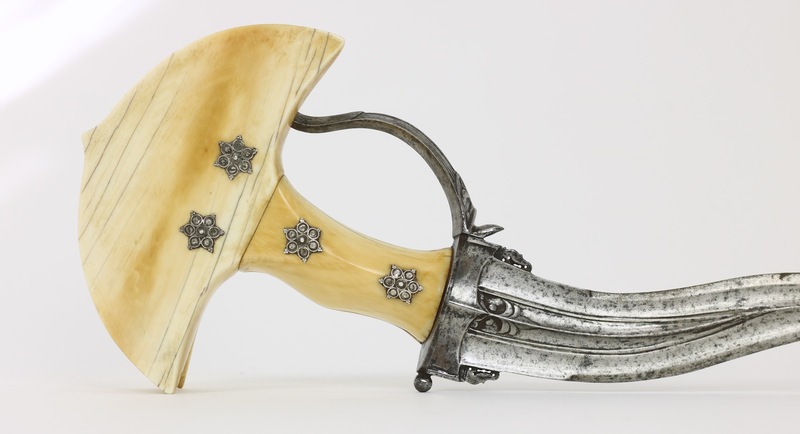 Presented with dagger to General A. N. Rich about 1855 for saving his life when attacked by a wounded cheetah. ". This is a stunning piece with gold and rubies, undoubtedly reflecting the level of gratitude of the Maharajah. A red thread among many examples seems to be the Vizianagram connection that Egerton already proposed. Excellent quality and condition throughout, one very small chip in one of the ivory plates. Nice, original, untouched condition. See photos. 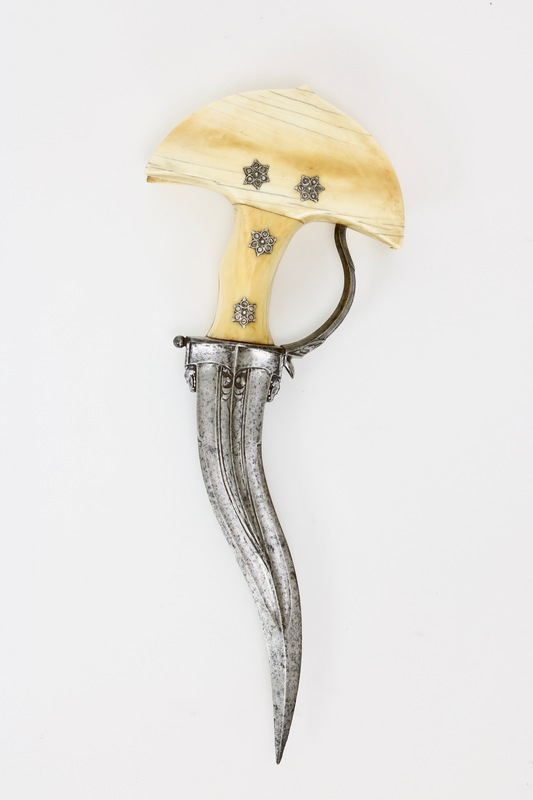 A very nice example of a rare type of Maratha dagger, commonly known as khanjarli . This example is exceptionally large, but with fine detailing in the steel. It has everything: quality, condition, and a most gracious form for its type. 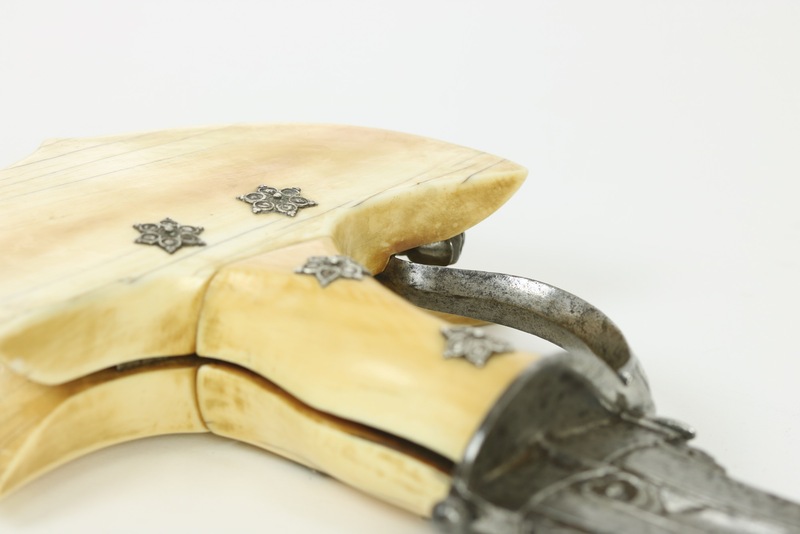 To meet the demands of the Convention International Trade of Endangered Species (CITES), this object is sold with an appraisal document from a certified Dutch appraiser of the TMV Federation, confirming that the item is manufactured in the 18th century. 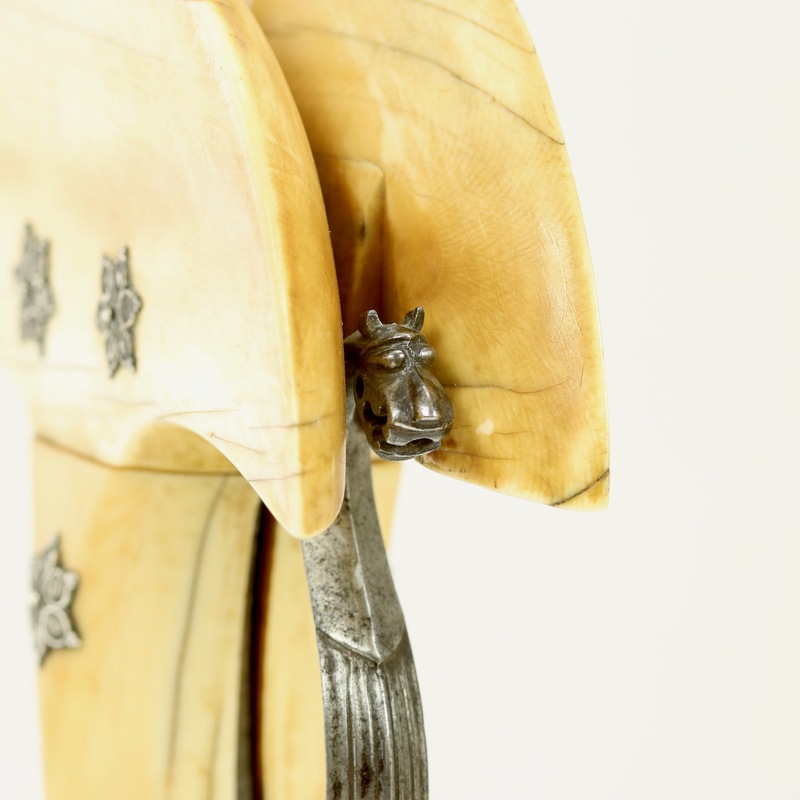 The handle is of ivory of the species elephas maximus , listed on CITES appendix I. The item is within article 2 of council regulation EC NO338/97 and within Convention of International Trade of Endangered Species (CITES): The materials were removed from the wild and significantly altered from their natural state well before the date of convention: June 1st, 1947. In principle, it can be freely traded within the EU. Beware that it may not be possible to export the item to your country due to restrictions on international ivory trade. CITES sets the minimal restrictions, countries and states under the convention often maintain further restrictions on top of CITES.